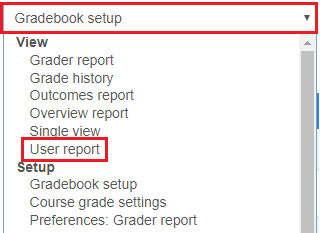 This page details how to view your course as a student, and view the gradebook as a student, helping you to understand what students see or do not see and helping to troubleshoot issues. To view the gradebook as a student, see the Viewing Gradebook as a Student section. Click on your user picture and name in the upper-right corner of your course website. Click on the Student button to select the Student role. 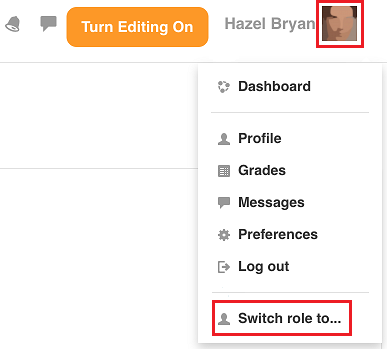 Note: Switching roles is not perfect because you remain the same user, and your user may not have grades and group status, which will make some student views look different than a real student might see. To get an 100% accurate view, the best thing to do is to email atlas-tlt@illinois.edu to ask for a test student account and enroll it in your course. It is useful to have this logged-in on another browser so you can quickly switch back and forth. From the drop-down menu, select Return to my normal role. In the Administration block, click Gradebook setup. Expand the drop-down menu and select User report. 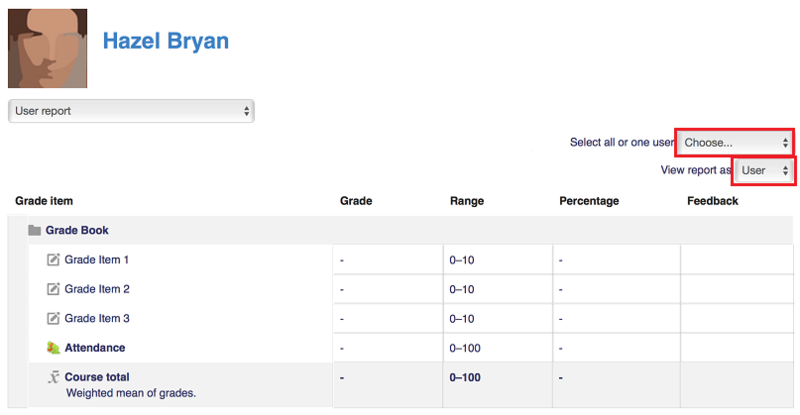 In the "Select all or one user" drop-down menu, select the student you would like to view the grade book as. In the "View report as" drop-down menu, select User.